This story is about 5 people connected by love, dreams and music. 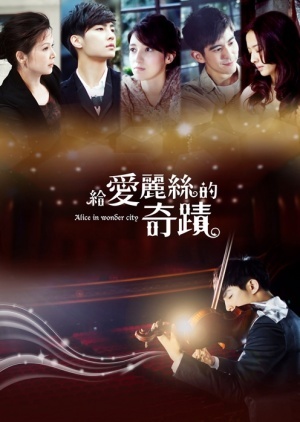 He Ting Yu (Aaron Yan) is a concertmaster, and is known for being a genius. Growing up as a child prodigy, he has constantly been put under pressure and has never known anything besides his violin. Due to the pressure, Ting Yu stopped sleeping and started getting paranoid. At the verge of madness he was saved by Kang Lisa (Yang Gui Mei), a café lady who helped him get over his insomnia and became a stand in mother. Lan Die Fei (Lara) is a huge fan of Ting Yu’s and when her sister offers her a job interview in the same concert hall; she is more than happy to participate. There she meets her idol, but is shocked to find out that his personality is completely different than expected. When a violinist is needed, Die Fei recommends Chen Hai Jie (Xiu Jie Kai) whom she had befriended, and started to be fond of, but even though Hai Jie has a happy personality, he has a history with a woman called ‘Alice’ (Tracy Chou). Even if he only spent few days with her, he isn’t able to forget her. Hai Jie manages to get the job, surprisingly directly from the moody concertmaster Ting Yu, and the two become close. So I started this, even though I love Aaron Yan, without any expectation of it being good. After watching 15 min, I realized that I really might just not be able to finish 15 episodes, mainly because the storyline sort of gave me a weird “what the hell is this about” vibe. But once I really watched it, I noticed how good it actually is. It is a very mature drama, which is rare (might also be the reason for the vibe), and the usual clichés are there, but made ‘realistic’ in that sense that they are too ridiculous like we are used to in other dramas. I had a hard time seeing Aaron playing the tough guy, though I believe he managed to pull it off. Also, Lara is great, not the typical pretty girl, but most definatly an amazing singer!